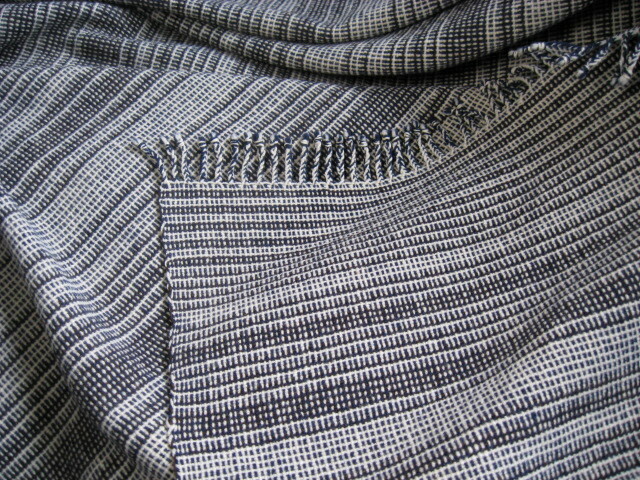 In my study of handweaving, one of the first things I was really excited about learning to weave was double-width cloth. Way back then my first floor loom was a 4 shaft, 36 inch wide jack loom, and I wanted to weave a woolen blanket that was wider than the width of my loom. In addition, I decided to weave it using color-and-weave effects. The images below don’t show it well, but I did make a few mistakes such as the “fold” mark that shows at close inspection and the selvedges on the open sides are not very neat. Next time I would try to weave it better by using some of the tips I learned in my recent research that is included in the Additional Notes at the end of this post. I created the weaving drafts to illustrate how I wove the Blanket. 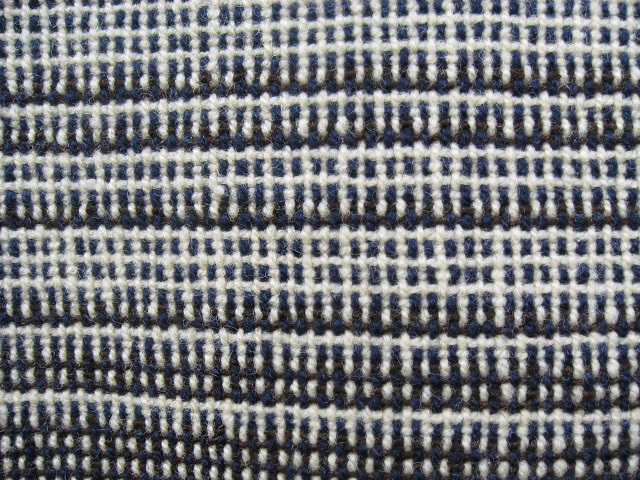 Draft 1 shows a commonly used threading and tie-up for plain weave, double-width cloth. It helps visualize the top and bottom layers, and the notes describe how to weave it so that one side is open and the other side is closed (the fold). If you want to weave a tubular cloth you would simply eliminate one warp thread at one end, begin at either side and treadle 1, 2, 4, 3. 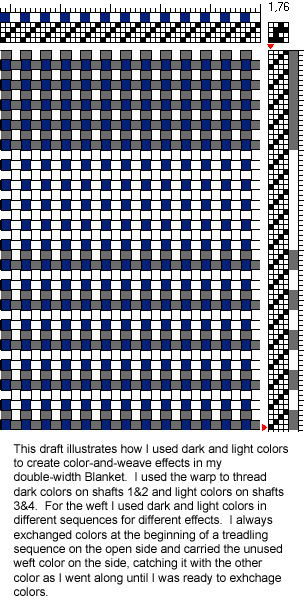 Draft 2 shows how I used dark and light colors to create the color-and-weave effects. For the warp I used a light weight two-ply (2/10) Vermont virgin wool (dark navy and white) that was spun with extra twist in the singles and in the plying so it was easier and stronger to weave with. I used the same yarn for the white weft and a singles less tightly twisted wool yarn for the dark gray weft. I sleyed the reed double than for a single layer cloth (10×2=20 e.p.i.). The Blanket was 36″ wide on the loom (72″ if opened) and about 100″ long. Once removed from the loom, I braided the fringes and started the finishing process: it went into the washing machine with a little detergent, about 10 minutes in the hot water, regular cycle, then in the rinse cycle, and finally in the dryer (knits setting) for about 30 minutes until it was dry. It shrunk to about 60″ x 80″ , about what I wanted, just a little felted and pretty soft. You would need to sample and experiment to see what you might expect for a final result because there are variables such as the type of wool yarn, the sett – a closer sett can result in a firmer and smoother felting, different washers and dryers perform differently, timing – longer agitation in the washer usually results in more felting, it can also be hand washed and air dried, etc. There are some links to a few online articles about the finishing process of woolens in my post, 2/2 Twill: Handwoven Woolen Wearables. One of the problems in weaving double-width is the fold line that can show when it’s opened up. To remedy this some weavers use a temple (stretcher) but then some don’t like the temple, some skip a dent before sleying the last two warp ends on the folded edge, and some use weights on the last few warp ends to compensate for the natural drawing in at the edges. Because it’s hard to see what’s going on in the bottom layer, some weavers use a mirror while weaving to catch any mistakes. I found a great online article at handweaving.net from the Master Weaver series (February 1953, #7), “Double Weaves, Circular and Double-Width Cloth,” that discusses in great detail the problems of the fold line. In her wonderful book, Exploring Multishaft Design (chapter 7 on double weave), Bonnie Inouye has some tips for weaving double-width cloth. One of her tips for the fold mark problem is to use “helper” warps, a few extra strong yarns next to the real warps (threaded through the same heddle and dent) that are removed when the weaving is off the loom. The Master Weaver article I mentioned earlier also has something about removing warp ends: to pull out some of the warp ends where they’re too close together and hoping that it will even out after washing. I would also recommend at handweaving.net, Paul O’Connor’s monograph, “A Reference Guide for Double Weave.” I find handweaving.net to be a great online resource because not only can you find thousands of weaving drafts but you can search by topic and find lots of articles and books to download and study. If you’re looking to weave double-width cloth in a weave structure that’s different than plain weave you will probably need at least 8 shafts. For example, there are several excellent articles about double-width overshot in Weaver’s Magazine, issue #34 (Winter 1996). Unfortunately, Weaver’s Magazine is out of print but you can find back issues on ebay.